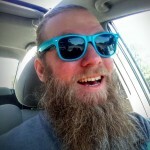 Hey, it’s Bryan from Go Media and today, we’re going to dip our toes into podcasting. You’ve probably heard there’s a ton of cash, arms full of lovelies, and loads of listeners just WAITING for you to put your voice into their ears. Or, you’ve just got some knowledge that you want to drop and this seems to be a worthwhile way to go about it. Either way, you’re probably asking yourself how to get started, and how can you get started without spending a lot of time and money upfront? That’s what I wanted to know about 6 years ago when a few friends and I wanted to start our own podcast. In this tutorial, we’re going to be looking at what equipment and software you should be looking into as you begin your journey into podcasting. Then, we’ll go into some tips and tricks on the recording and editing side. Now, full disclosure: I wouldn’t call myself a professional podcaster. I’m not making loads of money doing this, or going to awards shows, or seeing millions of downloads. Actually, that’s realistically a small percentage of all of the podcasters out there. And, my arms are empty, still waiting for the lovelies to arrive. But, as more and more people want to get into podcasting, it’s becoming apparent that there really isn’t a good “how to” out there. I learned a lot just by trial and error using existing equipment and free software that I had lying around from my days as a solo acoustic. 6 years later, I’m still using a lot of the same techniques and software. But, I’ve streamlined the process quite a bit so that I can podcast in any location, for any type of situation. On the professional side, I run the Go Media Podcast. We set up the conference room with three mics so that Bill, Heather and I can talk to each other, as well as our guests over Skype. We run our mics through a mixer that connects to my laptop. With the help of a 5-way stereo audio splitter, we can all connect our headphones to the mixer so we can hear our virtual guests. On the personal side, I also run 5 other podcasts through the Fans Talk Podcast Family. There, I do a majority of the podcasting with virtual co-hosts over Skype, Google Hangouts, Blab.IM, or whatever else we wind up trying out. And yes, four of the series revolves around the wonderful world of professional wrestling. For those, I connect with various guests from all over the world via Skype. You know that whole thought about not spending a lot of time on it? Well, I am known to over-extend myself a bit, but it’s become a passion, and honestly – how cool is it to know that people actually want to hear what you’ve got to say? Even if you’re talking about professional wrestling while drinking with your best friends? That’s awesome. If you’re doing a solo show, or meeting your guests over Skype, you can get started with less than $100 worth of equipment. If you want to have multiple people on one side, you could get a 2-3 person setup for under $300. I’m assuming you’ve already got a pair of headphones that you use and are happy with. 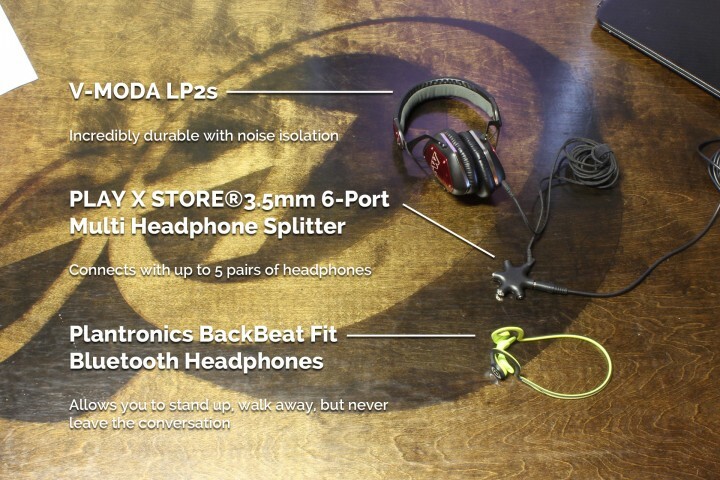 Just in case, I use V-MODA LP2s. Luckily, they were a gift I received as a groom’s man. Otherwise, I might not have picked these up as they’re a bit out of my price range at around $200. Legit, they are the best pair of headphones I’ve ever owned. They really give me a great, focused sound. And, when you listen to music with these, the experience is amazing. However, sometimes being connected to my laptop with a cable isn’t ideal. If I’m only doing a solo episode, or am the only person on my side as I connect with someone over Skype, I tend to use my Plantronics BackBeat Fit Bluetooth Headphones ($90). I got the green ones. They connect right to my laptop without an issue. While they do come with a microphone, the quality is not great. Not good enough for podcasting, that’s for sure. I didn’t buy these specifically for podcasting, but have loved the flexibility it has given me during recording sessions. Since I do a majority of my podcasting at the home studio standing up, not being attached to the laptop with a cable is really nice. I can move around, walk away to get a beverage refill as my co-hosts continue to talk, and I don’t lose the ability to hear them. But, in the end, as long as they aren’t leaking audio out into your mic while you’re recording, and are good enough to use to listen to music, you should be fine starting out with whatever you have handy. This is a hot button topic for a lot of the podcasting industry. Condenser mics vs. snowballs, USB-powered vs. XLR-exclusives that go into a mixer, there are so many ongoing debates, it might be difficult to really find what works best for you and your budget. I skipped all of that and went with something that seemed to be a good fit for my needs, as both a podcaster AND a musician. As well as someone who might just record with a guest over Skype or might connect with multiple people through a mixer. I wanted to be able to have flexibility without a load of different equipment. I went with the Samson Q2U Handheld Dynamic USB Microphone. Out of the box, it also comes with a pair of headphones and some recording and editing software, but I never had much use for either. Headphones aren’t super comfortable, but in a jam, they can come in handy. And software is dated and really not useful for me, but maybe it could be for you. Anyways, the Samson Q2Us can connect to either a USB input or can connect with a mixer via XLR. Or both at the same time, depending on how you’re recording or what you’re recording. It comes with both cables, so no need to have to pick up anything additional. 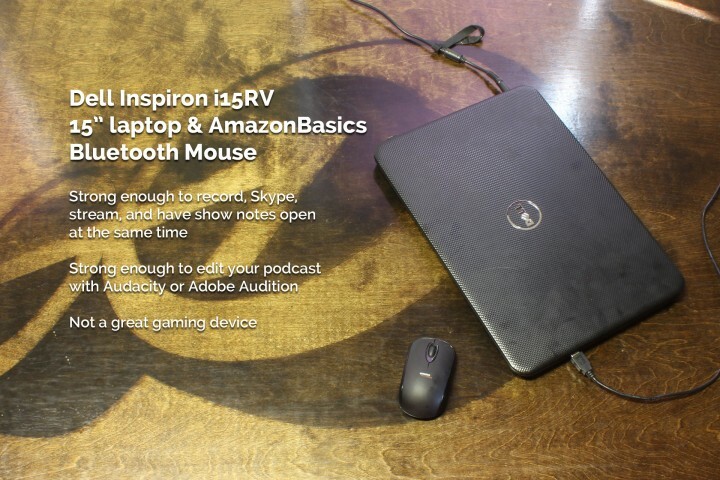 You can plug your mic directly into your laptop or desktop with a USB cable and start using it right away. Once you choose a microphone, you’ll need something to hold your mic for you. I’ve gone the route of desk stands, as well as boom mic stands which I took from my days as a musician that did semi-frequent shows around town. But, recently, I’ve fallen in love with my NEEWER Microphone Suspension Boom Scissor Arm Stand. They connect to the edge of the desk and can move around with you. If you want to sit, they can position right in front of you without a problem, and without getting in the way of your hands or your view of your guest, notes, beverage, mixer, or laptop. I’m also terrible at popping my ‘P’s, so I doubled up with two air filters. One is the On Stage Foam Ball-Type Mic Windscreen. This wraps around the mic itself, and keeps away any air that might be flowing through the room towards the mic, like fans and heaters. 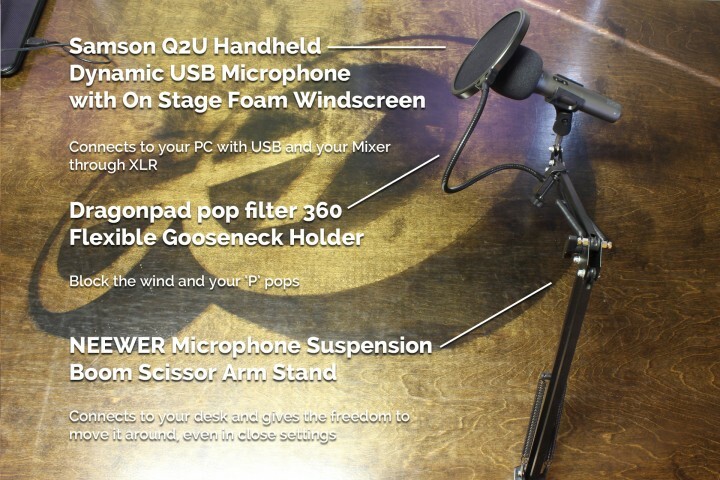 Then, I added a Dragonpad pop filter 360 Flexible Gooseneck Holder, which attaches to the mic stand. This adds a much needed buffer between me and my mic. After months of debate, and knowing that we’d be having multiple people in the studio at Go Media, I decided to pick up a mixer. 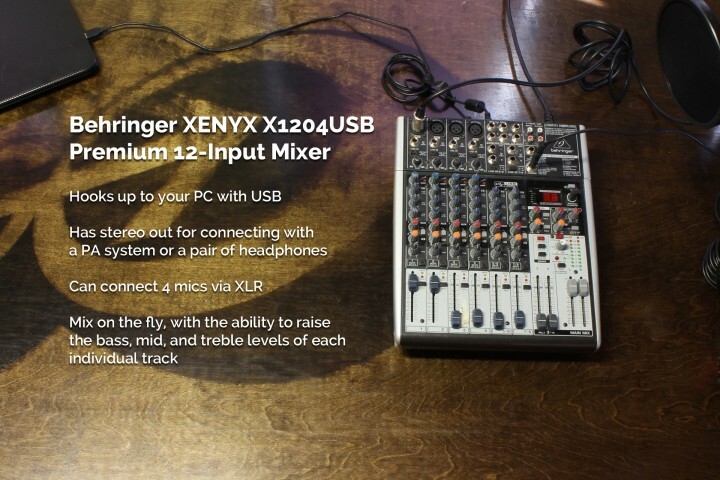 Specifically, the Behringer XENYX X1204USB Premium 12-Input 2/2-Bus Mixer. At $230, it might be outside of your price range. And realistically, it might be completely out of your needs as well. But, if you plan on sitting in-person with 2-3 other guests and don’t want to have to share a mic, this is a good option to have. And, just in case you’re doing a mix of 2-3 guests in the studio with you as well as a guest over Skype, you’ll want to pick up a headphones splitter. That way, you can listen to the output from the mixer and everyone will be able to hear themselves and the Skype audio. I use PLAY X STORE®3.5mm 6-Port Multi Headphone Splitter, and at $5.50, it’s a really handy. It will split your audio for five headphones and all in stereo. Besides using it for podcast work, Heather and I also use it when we record Designer Face Off. This goes without saying. I must have something to write notes in. I try and keep track of coughs, Skype drops, or anything else that is either worth looking into removing from the final edit, or follow up questions to ask. So for me, I go with the Go Media pocket notebook that was made available at this year’s WMC Fest. 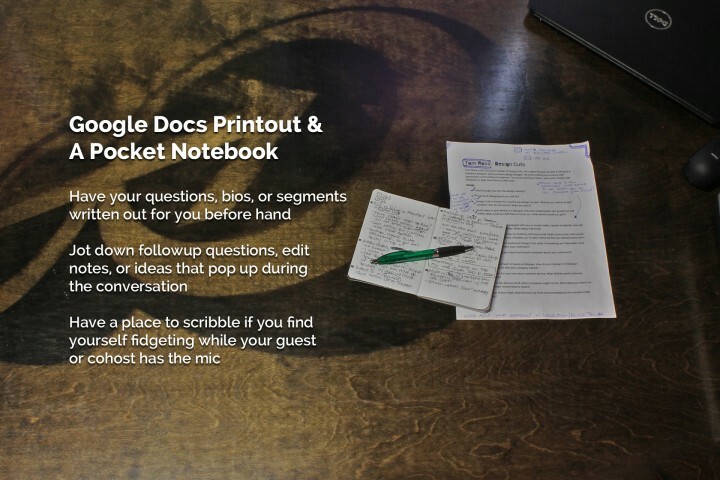 But, use whatever is available: sticky notes, a napkin, a moleskin, back of an envelope, etc. You can get started with what you already have. Whether it’s the work-provided desktop or your personal laptop, you can do a lot with little. For the first 4 years, I used my basic, under $200 tower to get the job done, and it did. For a while. Now, I mostly use it for show notes and talking to the live chat, or pulling up wikipedia to fact check my co-host. Now, I use a Dell Inspiron i15RV 15” laptop. It’s got a 1.4 GHz Processor, 4GB DDR, and a 320GB Harddrive. Really, I didn’t even buy it for podcasting. I bought it so I could work remotely from the coffee shop. But again, it gets the job done. I’m a Windows guy. They’re easy for me. But, Macs offer a lot of built-in support that’s enviable. Garageband specifically. So, by all means, do what feels right. If you’ve got a Mac, Garageband is a great tool for recording and editing podcasts. Windows doesn’t have that. But, you can record and edit with some free software. If you want to share files easily between hosts, including some quality cloud-based archiving, you could be looking at about $100 year at Dropbox/Google. If you want stream your audio live, add another $100. If you want to host your mp3s on a social-powered service with some slick, Facebook and Twitter friendly embeds, add another $135. 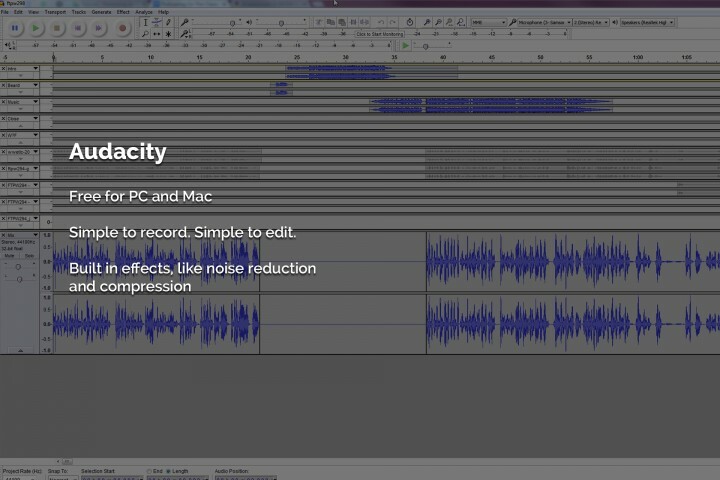 Audacity is free for both PC and Mac. For Fans Talk episodes, we’ve all become accustomed to recording individually through Audacity. Then, everyone exports their audio to an .ogg file, which is higher quality than an mp3, and a smaller file size than a .wav. It’s somewhere in the middle, which is great for file transfer speeds. Quick Tip: I make sure my recordings are at least above -30db. That way, if there is background noise, which normally hits around -42db and below, it’s easier to remove. And, always record about 5 seconds of audio of just your background noise. Keep the mic on and just sit back quietly so that you can isolate that noise when you edit. And yes, I also edit all of my episodes with Audacity, but we’ll get into that in a bit. 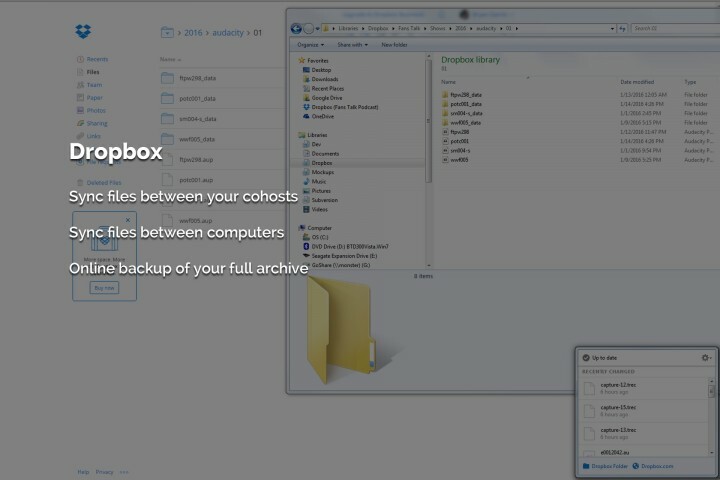 I’ve been using Dropbox for years to keep all of my PCs synced together. It helps me go from recording on the laptop to editing on a faster system like my desktops at home and at work. It also allows my co-hosts and guests to be able to send me their files. Either they upload to their own organized folder structure, or we share folders. Or, in the case of someone just doing a one-off appearance, I’ll have them upload to Dropbox using the new “File Request” feature, which will allow them to upload even if they don’t have a Dropbox account. Dropbox comes in three tiers. The free account gives you 2 GB of cloud storage. For $9.99/m, which is the tier I’m using, you get 1 TB of space. And, for $15/m per user, you can get the Dropbox Business account, which gives you as much storage as you need. Recording on Audacity isn’t for everyone. Nor is it always possible. So, how can you get a solid, individual track of my guests and co-hosts? While I’ve tried various Skype recording extensions, nothing came out perfect. Primarily because, technology isn’t perfect. Skype could drop at any moment, or the internet could buckle causing the audio to come to me to be really poor and useless. While a few different sites like this have come out over the last few years, Zencastr is the new kid on the block. It records all sides of the conversation into individual tracks, which streams and saves to my dropbox instantaneously. 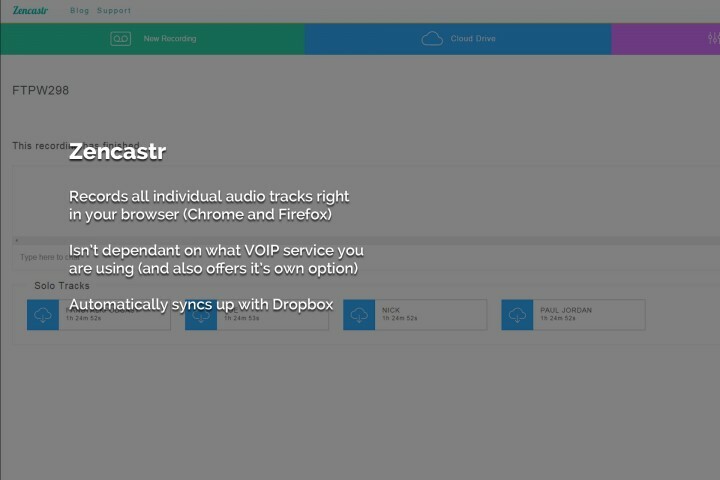 And, if you want to eliminate Skype or Google Hangouts, Zencastr just added a VOIP service to it’s features. But, keep in mind, this is just in beta. So, it can be a bit buggy. Zencastr is currently free, but once they get out of beta their plans could range from $10/m to $20/m. Limited to 3 hour shows. Sometimes, podcasting can easily start to feel like you’re talking to yourself or with a friend in a box. You might see downloads grow, but quality feedback, especially for a weekly series, is never guaranteed. I actually don’t expect it anymore. However, that feedback is so great. And timely feedback is even better. But, what if you could get instantaneous feedback as you record? That’s where a service like Mixlr comes into play. It’s an app that works with PC and Mac, and even your iPhone and Android if you’re into that sort of thing. Depending on how often or long you record, Mixlr will stream your audio and provide you a nice chat from $9.99/m ($99/y) to $49.99/m ($499/y). I use the first tier. 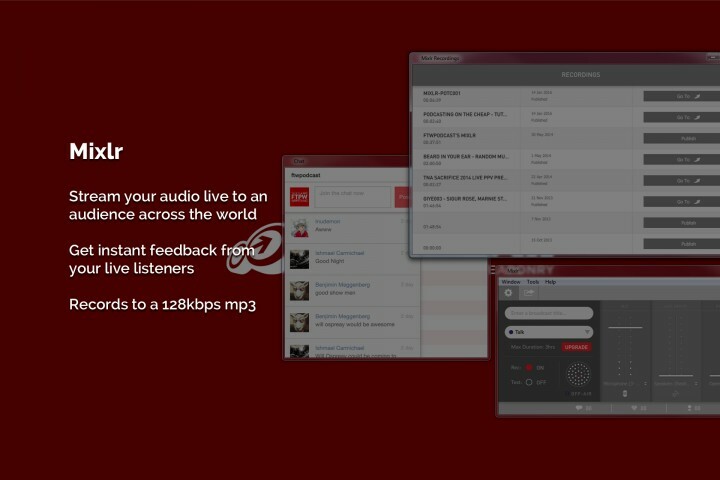 There’s also a free version and it allows you to stream for an hour at a time. I’m really hoping this helps you start to think about what you need to get started with your new podcast. But after equipment and software, it’s time to start recording and editing. I go in depth about the recording and editing process using Zencastr, Mixlr, and Audacity in my video tutorial on Go Media’s Arsenal. The whole wide world is waiting for you. Best of luck and let us know how it goes!